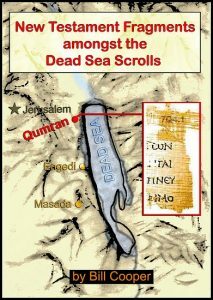 In 1955 there were discovered several papyrus fragments in Qumran Cave 7. The unusual – and unexpected – feature of Cave 7 was that all of its fragments were in Greek, as opposed to the exclusively Hebrew and Aramaic scrolls that had been found in the other caves. Apart from two of the fragments which were from the Greek version of the Old Testament (Exodus and the apocryphal Letter of Jeremiah), the rest of the fragments from Cave 7 were all catalogued as unidentified, and were considered indeed to be unidentifiable. That’s how things remained until 1972, when the papyrologist, Dr José O’Callaghan, thought that he would try to identify them. They were housed at the Rockefeller Museum in Jerusalem, and in April 1972 he was able to do a hands-on examination of each of them and to take a series of infra-red and other photographs. What he discovered concerning them was to shock the academic world – the fragments belonged to books of the New Testament.